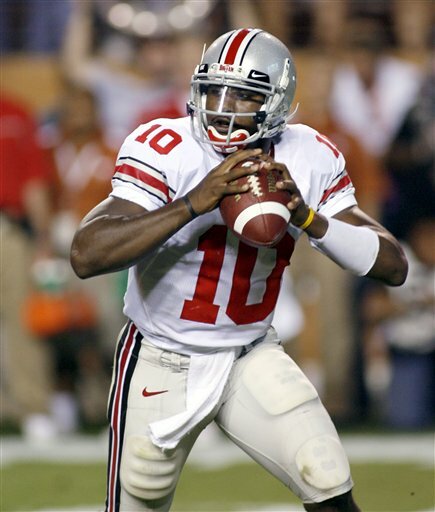 Update (post-Game): Ladies and gentlemen, allow me to introduce you to your 2006 Heisman Trophy winner, Troy Smith. We here at MotSaG tip our hat to Troy, who played a flawless game. Almost all incompletions were drops, he stood in the pocket and was in complete control. Troy had made a bad throw or two, but looked amazing. The first quarter just came to an end with Gonzo carrying the Buckeyes all the way down the field, capping off the drive with a catch in the Endzone. Half just came to an end, but Ohio State got completely jobbed on the roughing the passer call. Everyone watching this game knew that was a bad call, but Texas had a nice drive to punch the ball to tie the game. But Texas can not stop Troy Smith, he is absolutely shredding Texas’ secondary. The 29 yard TD to Ted Ginn Jr. with 11 seconds left in the half was a thing of beauty. Ohio State goes in at the half winning. I’m a little nervous that we’re having trouble stopping the run. Charles has been better than Young, but they’re both playing well. McCoy has only thrown a couple passes downfield, but he’s playing well. Our Defense has been better than I thought we’d be, but stopping the running game needs to be a priority. Troy Smith is looking great, laser accurate and patient as heck. Gonzalez has completely owned Texas’ defensive backs and Ginn is playing well. We haven’t been running the ball well, but we haven’t had to. Here’s to a great second half. McCoy made his first mistake, throwing over the middle right to Lauranatais, setting up the only 3rd quarter score. With two minutes left in the fourth quarter, I think it’s safe to say that Ohio State validated their top ranking. It seemed like Texas threw in the towel around the five minute mark, with Colt McCoy running an option play on third and long. That was a little disappointing to seem them so deflated, but they got absolutely worked. Congratulations, Ohio State, the #1 team in the nation. Men of the Scarlet and Gray is proudly hosted on 1&1, running WordPress and using the News Theme from StudioPress.com.